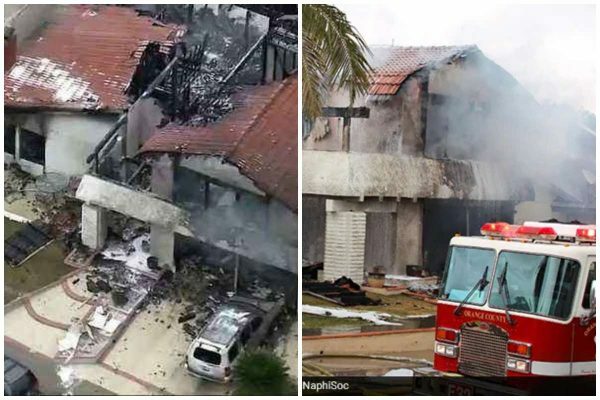 Five people have died in Southern California after a small plane crashed into a house on Sunday, setting it on fire. Local Media reports that the flight got into trouble barely minutes after taking off from a local airport some 20 miles (32km) south-east of the city. Firefighters at the scene of the crash informed local media that two people are being treated for burns at a nearby hospital. Video showed plane parts scattered on the ground and on rooftops and residents of the neighbourhood trying to fight the blaze caused by the crash with garden hoses as black clouds of smoke rose into the sky.